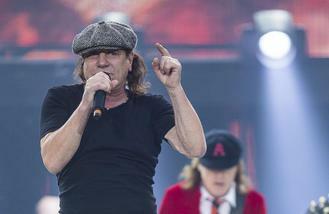 AC/DC's Brian Johnson has recorded two tracks for 'Saturday Night Live' star Jim Breuer's debut album. The 68-year-old rocker had to pull out of his band's 'Rock or Bust Tour' or risk suffering "total deafness" due to a serious hearing problem and the tracks, including the song 'Mr. Rock n Roll', are the first heard from Brian since he took a break from the band. The song features the 'Highway to Hell' hitmaker's vocals and Jim's recorded over a huge guitar riff by former Anthrax guitarist Rob Caggiano. Talking about song, which features on his forthcoming heavy metal LP 'Songs From the Garage', Jim said: "Don't ever underestimate someone's ability to live for the moment. At the end of the day everyone has a 'Mr. Rock n Roll' in them." And on working with the music legend, 48-year-old Jim - who was on 'SNL' from 1995 to 1998 - says he's still "in awe" of the rock star. He told Rolling Stone magazine: "To me, Brian is the most powerful voice in rock & roll. He is also the funniest and most generous man I have ever known. I am still in awe of how he recorded the song and forever thankful." The pair joined forces last year when Jim performed some songs to Brian and he asked if he could see the lyrics. They then went into studio with just a mixing board and microphone in their arsenal to record together. Meanwhile, Brian has met with an ear specialist who has vowed to repair his hearing so he can perform on stage again. Stephen Ambrose, an in-ear monitor specialist, previously said: "If anyone deserves to benefit from my research It's Brian, who has been giving incomparable performances for years, despite increased hearing loss. "I'm going to do my utmost to see if our breakthroughs can help him." Brian has been replaced for AC/DC's remaining concerts by Guns N' Roses singer Axl Rose. 'Songs From the Garage' will be released on May 27. Country music star Dolly Parton is pulling out all the stops for her marriage vow renewal ceremony. Michael Buble has been forced to cancel a number of upcoming appearances to undergo vocal surgery. Rage Against The Machine have launched a mysterious new online campaign - ahead of a huge announcement. Anthony Kiedis is "on the mend" following his health scare his Red Hot Chili Peppers bandmate Chad Smith has revealed. Justin Bieber has been banned from touring in Argentina. R&B star Ciara has lost her battle for sole custody of the son she shares with ex-fiance Future. Celine Dion has spoken of her heartbreak at the loss of her husband in a revealing interview. Police in Illinois have launched a manhunt for Irish singer Sinead O'Connor after she went missing in Chicago on Sunday.